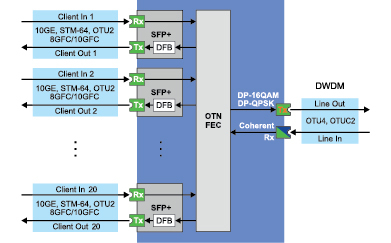 Aggregating transponder (muxponder) transmits client channels to one OTU4 DWDM channel. MS-200E transmits data in OTN format using Soft-FEC error correction of 20%. Tunable by the wavelength of the laser allows to organize a 200 Gbit/s DWDM channel in the 50 GHz C-band. Supports the transfer of channels in 200G DP-16QAM mode. The unit has a service ESC channel inside the OTN OTU4 service headers on the working wavelength of the muxponder.